The Southeast native corporation, Sealaska, gave Wrangell’s local tribe a piece of land known as Totem Park. At Sealaska’s anual meeting in Wrangell last weekend, the corporation presented the deed for Totem Park to the Wrangell Cooperative Association. The park is a small plot of land in downtown Wrangell where the most recent Kiks.ádi, Gagaan Hít (Sun House) stood. Four totems stand there today. Sealaska received the park land in the 1980’s from a lumber company. The corporation’s board unanimously agreed to transfer the land to the local tribe in June of this year, responding to the tribe’s request. The park is a cultural treasure to Wrangell natives, but the acquisition itself is another win for the landless community. In 1971 the federal government enacted the Alaska Native Claims Settlement Act, which created over 200 regional and local native corporations that received land and funds. But for reasons that are still unclear, Haines, Ketchikan, Petersburg, Tenakee and Wrangell were left out, and unable to each receive 23,000 acres given to other Southeast communities. Alaska native activists and senators Lisa Murkowski and Dan Sullivan support efforts to include the five communities in the act, but nothing has happened yet. Rinehart believes that makes this land transfer even more important. “In this case you have a local tribe that is landless and has only very few parcels of land. 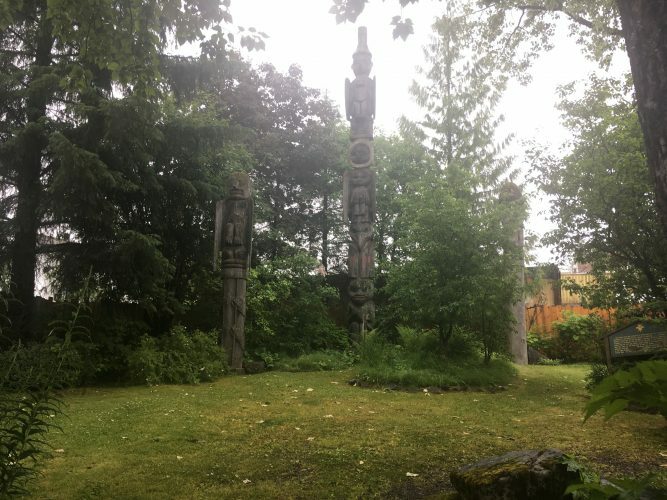 Every little bit of land that they can receive especially when it has a long cultural, historic piece to it is very significant to them,” says Sealaska Director and Wrangell native Richard Rinehart. The Wrangell Cooperative Association has other land in the island town, most notably where the Tlingit Chief Shakes’ house sits. The tribe’s administrator Esther Ashton says Totem Park will complement that piece of native history. “Our culture is all about balance, so it’s about balance between the raven and the eagle and currently the chief shake’s house is an eagle house. So we would hope in the future to be able to do a raven house or some type of structure like that there,” she says. The park is named after the Kiks.ádi Totem, raised back in 1895 to honor clan leader Chief Kahlteen. The park was dedicated in 1987 when a replica of the original totem was built.